[0:03] <dreamer> how can i get this, or the latest, kernel then ? [0:03] <pingo> For this reason, the unswitched star topology is not recommended, and no guarantees can be made about its performance. [0:03] <pksato> or via apt. [0:05] <pksato> but, kernel upgrade can broken all system. [1:12] <azizLIGHTS> anyone using weechat on their pi? [1:12] <azizLIGHTS> or any other irc client, and making heavy use of it? [1:15] <azizLIGHTS> and you use xchat on a gui then i presume? [1:16] <azizLIGHTS> Megaf: cpu usage from xchat? [1:16] <azizLIGHTS> shiftplusone: cpu usage from hexchat? [1:18] <shiftplusone> Nope, not on a pi right now. [1:39] <NastyNaz> i have a server that is launched by the command 'sudo ./sc_serv' - how do i make sure this is automatically run every time the pi boots? [1:41] <NastyNaz> shiftplusone: which is easier? [1:42] <shiftplusone> NastyNaz, rc.local is as easy as it gets, but it's not the "right way"
[1:44] <shiftplusone> I'll leave that up to you to figure out. [1:44] <NastyNaz> shiftplusone: do I just add 'sudo /home/sc_serv' to the bottom of it? does that start it up in the background? [1:45] <shiftplusone> and rc.local is not something YOU run. [1:48] <NastyNaz> adding something like '/home/sc_serv &' should work? [1:49] <kandinski> compiling a package on the raspberry pi is going to take forever, is it not? [1:50] <shiftplusone> Hello world? No. Firefox... yes. [1:58] <Megaf> Firehopper, is that a RPi? [2:08] <Tenkawa> so which of the bsd's is the most flexible on the rpi atm? [2:10] <qjsgkem> the image in that snapshot has a few rough edges, so I want to roll my own. [2:12] <qjsgkem> "As the raspberry pi port is still not part the stable release, you will want to use the HEAD branch"
[2:14] <Tenkawa> which os ? [2:15] <kandinski> shiftplusone: compilation takes 1'15" to 1'30 on intel. How long you reckon it can take on raspberrypi? [2:15] <shiftplusone> probably 8 times that assuming it doesn't run out of memory before it's done. [2:16] <Tenkawa> kandinski: what you trying to compile? [2:19] <kandinski> what do you use the bbb for? [2:19] <Nexuist> does anyone here have experience with CUPS server? [2:22] <Tenkawa> what board would you upse though? [2:35] <shiftplusone> qjsgkem, the reverse engineering effort seems to be on hold since the folks involved have other things going on. [2:35] <qjsgkem> oh... too bad. "videocore"? [2:36] <Cheekio> any idea why when I vnc into a box, the HDMI output can see me move the cursor around, but when I try to open a video it's piped to the vnc output, not to the HDMI screen? [2:38] <Tenkawa> shiftplusone: isnt there a video output device for the non-x fb? [2:39] <Cheekio> Is there a preferred player for raspbian? [2:41] <Tenkawa> too bad no jelly bean or kitkat android for the rpi yet right? [2:47] <Tenkawa> 2.3? isnt that very old? [3:12] <iamsmrtk> Hey, i've got a question. I'm running my pi headless and every now and then i lose my network connection. At this point i'm pretty screwed because when i plug in my keyboard/mouse again, they don't work and i have to unplug the power to access it again. After a few times of this, my SD card starts to get corrupted and I have to reformat it. How can I have it autodetect either my ethernet or usb ports when things get reconnected? [3:17] <shiftplusone> ah yeah, it's the only player that actually uses omx, so it's definitely going to be better than the usual desktop ones. [3:35] <home> clever: How would I do that? [3:37] <clever> Non-free firmware is required, which can be provided by installing the zd1211-firmware package. [3:40] <home> what do I download? [3:41] <home> where to download package manualy? [3:42] <home> where to download file? [7:18] <clever> i'm probly not the first one to ask, but " and @ are backwards on my pi! [7:21] <phalacee> have you changed the region/keyboard at all? [7:25] <clever> phalacee: how was it changed? [8:28] <Habbie> D4CH_RPi, you mean, turn the pi into a bridging wifi AP? [8:37] <Habbie> then as ShorTie said, why not drop the DDWRT out of the picture and use just the pi? [8:38] <Habbie> not if your pi forces everything through tor! [8:38] <ShorTie> is there much traffic on the wifi ?? [8:38] <D4CH_RPi> Why wouldnt it work if its trafficed through tor? [8:45] <Ben64> just charge the people a couple dollars a month? [11:25] <cas> Hi, I am quite new to electronics and try out my new gertboard. I wired all the B1 to B12 and have the jumpers in place and have a jumper on the top pins of J7 (the 3V3). When I run the led test application only the 5 middle leds are blinking (they are off from boot), the rest of them stay on all the time (from booting on). Any ideas what I could do wrong? [11:42] <ShorTie> you took the jumper off of j7 ?? [11:45] <shiftplusone> How are the things? [11:45] <ShorTie> as boring as ever, lol. [11:47] <cas> ShorTie: yes, not good? [12:36] <ShorTie> vnc will not work ?? [12:54] <Jck_True_> pagios: http://www.adafruit.com/products/1535 <-- Like that? [13:06] <skroon> anyone that might have some idea, that I could tryout next? [13:36] <k_sze> I mounted a 500 GB external drive. [13:42] <D4CH_RPi> k_sze: which file system is it formatted as? [13:42] <kfunk> k_sze: mounted the wrong partition? [13:42] <D4CH_RPi> and has it got more partitions? [13:42] <k_sze> There's only one partition. [13:42] <kfunk> 200 MB looks like a boot partition or sth. [13:45] <k_sze> erm, which pastebin do you prefer? [13:49] <k_sze> the disk has a GUID partition table, by the way. [13:50] <k_sze> I *have* to specify the size? [13:57] <skroon> anyone in her using xbee's with raspberrypi ? [14:34] <batfastad> Hi everyone. I'm looking to ditch my D-Link DCS-932L night vision cam as directly connecting to the MJPEG stream with VLC is a nightmare. So the Pi NoIR camera looks ideal! [14:35] <batfastad> The only problem I've got is case and ir illumination. [14:38] <pksato> buy IR leds and mount illuminator. [14:39] <pksato> or buy one of for cctv. [14:43] <batfastad> That's awesome! And I could just mount that around the camera. Could those LED boards be powered from the pi? [14:48] <batfastad> I know very little about the electronics side of things unfortunately, I'm more of a software person. But that looks promising. [14:49] <pksato> Have a cam module? [14:49] <batfastad> Vostok: Why? Is there just not enough power? [14:50] <pksato> IR illuminate small area. [14:50] <pksato> like a lantern. [14:51] <SpeedEvil> IR is _not_ thermal IR - just to emphasise. [14:51] <SpeedEvil> It will actually require external lights. [14:52] <pksato> Yes. Is Near IR, or optical IR. [14:59] <pksato> for surveillance? wildlife monitoring? [15:02] <batfastad> The D-Link is fine but the ActiveX/Java is really annoying. And directly connecting to the MJPEG stream is unreliable. 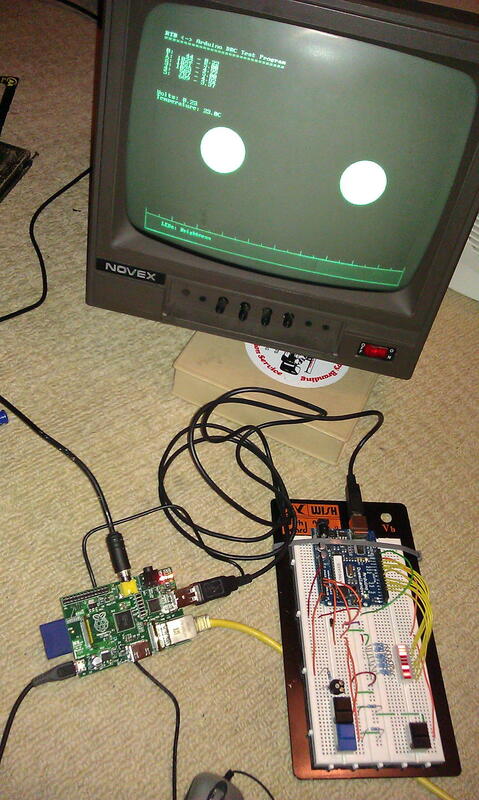 I'd love to do something with a Pi and a proper video stream. [15:03] <batfastad> Having separate power for the IR illumination and the Pi is a bit disappointing though. I'd like to get the whole thing together in a single case with a single wire (USB wifi dongle for networking). [15:26] <IT_Sean> I blame you. [15:32] <Davespice> if you were going to do an experiment where you posted a Raspberry Pi with a GPS tracker in it, from say one side of the country to the other, just to see where the postal service sent it, how would you go about it? what kind of battery would you use? [15:33] <IT_Sean> I would also come up with a way to "sleep" the raspi (safely shut it down, then power it back up). And only take position data once per hour or something. [15:33] <IT_Sean> real time reporting would use too much power. [15:34] <ReggieUK> are you allowed to post stuff with the batteries connected? [15:42] <Davespice> could just power it through the gpio? [16:11] <pingo> Is it possible to make a script that starts x and opens a browser on startup? [16:13] <pingo> How would I do that? [17:29] <Nefarious___> is there any reason why a raspberry pi would randomly kill a task? [17:30] <Nefarious___> I don't think thats the case. I'll explain in a mo. [17:32] <Habbie> what's the parent process? [17:35] <Habbie> is the bot a python script? [17:35] <Habbie> how do you start the bot? [17:38] <Habbie> if you start the bot, do you get your shell prompt back immediately? [17:39] <Habbie> can you make it run in the foreground? [17:39] <Habbie> in that case, does it print anything when dying? [17:39] <Habbie> also, next time it dies, type: echo $? [17:40] <Habbie> when does it die, then? after your ssh gets disconnected? [18:03] <Pawnerd> Is it possible to automatically open a webpage in full screen mode every time my raspberrypi boots? [18:04] <Kake_Fisk> Do anybody know why "amixer cget numid" doesn't work ? [18:34] <Olipro> is it possible to change the SPI speed? [18:34] <Olipro> and if so, how? [18:42] <Davespice> oh no! I have bugs! aaaarrrghh! [19:35] <IT_Sean> Greetings and salutations good sir! [19:49] <becnfecn> Is there still an issue with really slow ethernet performance on the pi? [19:50] <SpeedEvil> The ethernet is on USB, along with the USB port. [19:50] <SpeedEvil> So contention matters. [19:53] <Elenciu> is is possible to recover some pwm gpio output pins from the analog audio? [20:16] <gordonDrogon> Elenciu, if you're very good with a soldering iron, you can recover the 2nd PWM output. [20:17] * IT_Sean strickes out "good with a sodlering iron" and replaces it with "a soldering god amongst men"
[20:17] <gordonDrogon> karl-s, in theory yes, but in practice the latency will be too high and you might be stuck finding a kernel driver for your chip..
[20:32] <hid3> Hello everyone. Is it a good idea to use header pin #19 (labeled as MOSI) for a relay control? [20:33] <hid3> gordonDrogon: Hi. Maybe you could help me with the issue mentioned above? [21:46] <hosler> anyone interface their arduino uno with the pi? [21:51] <Elenciu> uhm... via a virtual ttl port ? [21:52] <hosler> IT_Sean: i will. thanks. [21:55] <gordonDrogon> hid3, don't know if you got an anwer, but it's ok to use that pin - just don't load the SPI kernel modules. [21:56] <gordonDrogon> you can connect the I2C directly, but while it works - I don't know how long it will work for - besides, serial is far easier and faster than I2C. [21:56] <gordonDrogon> yea, just use the usb serial port. [21:57] <gordonDrogon> it saves all the hassle of level converters as it's all done in the usb at 5v for you. [21:59] <hosler> gordonDrogon: why did pi decide to use 3.3v instead of 5v? [21:59] <hosler> or does that really depend on the CPU? [22:00] <gordonDrogon> hosler, yea, it's a 3.3v SoC. [22:00] <gordonDrogon> deller, you can start it and use ssh to connect in first time if needed. [22:01] <deller> how can i connect via serial? [22:05] <IT_Sean> you can convert it, though. [22:06] <hosler> extra wad of bits? [22:06] <hid3> gordonDrogon: what are SPI modules and what are they used for? [22:10] <gordonDrogon> hid3, SPI is a high speed serial interface - used to talk to other computers and devices like a/d converters, etc. [22:30] <qjsgkem> is it some release version oir HEAD/-current? [22:31] <qjsgkem> oh kay. might try that, too, later. [22:44] <davor> what's the simplest way I can get continuous audio spectrum analysis (outputted as a list which has n elements, one for a specific frequency range, and volume of corresponding range as value of element) which I can then use in a python script? [22:53] <ShorTie> is that like miracle grow ?? [23:10] <akk_> Hi -- just got a pi cam, and none of the howtos I've found seem to work -- raspstill -o file never returns, and raspivid | nc doesn't seem to send any data to the remote host. [23:10] <akk_> Is there some way to query for the camera to see if the hardware is even showing up? [23:11] <ShorTie> did you turn it on in raspi-config ?? [23:24] <akk_> There is no /dev/video* -- should there be? [23:28] <akk_> I can't find any pages that even mention what module should be loaded for the camera, or what /dev device it uses. [23:31] <gordonDrogon> there's no device as such, just some utilities AIUI. [23:33] <akk_> gordonDrogon: Will raspivid work from cmdline, without X? [23:33] <akk_> I don't have a monitor connected. [23:35] <akk_> and ran mplayer on the host ... it said it was reading from stdin but the buffer stayed at 0. [23:38] <ShorTie> have you looked here http://www.raspberrypi.org/camera ?? [23:40] <akk_> I'm guessing I have it plugged in wrong. [23:40] <akk_> I wish there was a non-video page on how to plug in that connector. [23:41] <akk_> That page mentions not bending the cable -- I don't have the cable bent at all, so if I'm supposed to bend it, that may be the problem. [23:41] <ShorTie> have you tried a simple picture with raspistill -o image.jpg ?? [23:42] <akk_> raspstill -o filename.jpg never returns, just sits there doing nothing, no error msgs or anything. [23:51] <akk_> I think I have the cable oriented the right direction, but I'm not clear what to do with the plastic thingie after I've inserted the cable. [23:51] <akk_> Should I be forcing it over the cable, bending the cable in the process, to lock everything in place?